Since the invention of the first coffee filter, coffee filters have been a fundamental part in the coffee brewing process. In fact, filters are as crucial as other tools used to make coffee such as coffee grinders, coffee makers, and coffee pots. They not only prevent coffee grounds from finding their way into the coffee, but help improve the coffee extraction process as well. With a simple paper filter, for instance, you’d be able to extract coffee with hot water while preventing the coffee grounds from ending up in the coffee. The most common of all filters are the paper filters. They have been around since the invention by Melitta Bentz. Today, Melitta filters are still being sold for both home and commercial coffee makers. Paper filters are cheap, disposable, and readily available. However, paper filters are not environmentally friendly as they need to be disposed of after every brew. Nevertheless, paper filters are still widely used, and are very versatile since these can take on both fine and coarse grinds. Probably the biggest drawback with using paper filters is that these tend to leave a papery taste to the coffee. The second type of coffee filters is the Gold Tone Filter. These are much more expensive than paper filters since some of these are actually made of 23 karat gold. Gold does not interact at all with water. As a result, Gold Tone Filters give a much better flavor. Some coffee makers, such as the more expensive Cuisinart coffee machines, already come with their own permanent Gold Tone Filter, eliminating the need to purchase the disposable paper filters. Additionally, Krups also sells its own Krups Gold Tone Filters. These are also very easy to clean. All it takes is a quick rinse to dislodge the coffee grounds from the mesh. Gold Tone Filters can also be placed in the dishwasher. Despite being more expensive, Gold Tone Filters save you money in the long run since there is no need to keep replacing your filters anymore. Then, there are the much cheaper permanent filters, such as stainless steel filters. Some of these are gold plated. These are much more affordable than Gold Tone Filters, and these can also be reused over and over again. However, Gold Tone Filters still yield better flavor. Similarly, stainless steel filters can be cleaned the same way as their gold counterparts. The last and most seldom seen are cloth filters, which are essentially coffee filters that are made of unbleached cloth. Since the pores of cloth filters are larger than paper filters, finer grinds might be able to seep through the filter and into the drink. These can also be reused, and are often used with manual drip coffee makers. However, the biggest drawback with using cloth filters is they’re harder to clean since coffee grounds tend to stick to the cloth. 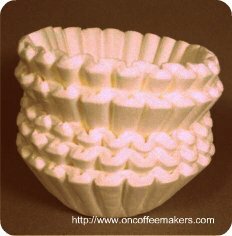 Learning how to save on bunn coffee filters would bring about lower cost for your coffee brewing in the long run. Coffee filter dispenser, another tip to good coffee. A filter can change the quality of your coffee.? My-Kap is a product that helps you enjoy keurig coffee maker even more! They allows you to use old k-cups and brew any coffee that you want. Surprised that keurig actually has single cup coffee filters. These are actually solutions that would better your coffee enjoyment with keurig single cup brewers. True, making coffee is easy these days. But, keurig k cup coffee take it one step further, combining ease with superb brew. Most of us are using disposable coffee filters, and are familiar with the issues that they have. So, if you think a permanent filter is better, consider Medelco’s 4 Cup Filters. Beehouse porcelain coffee cones are one of the simpler solution to brewing coffee and is not costly. Looking for a Thermal Coffee Maker that Uses Coffee cone? Have you heard of RSVP coffee maker? This together with coffee filter cone would brew you very delicious coffee. It would be hard to imagine that the color and even the shaped of a gold cone coffee filter would better your coffee, but it really does. Is it True that Coffee Cone Filters Brew Better Coffee? It is true that coffee cone filters would brews coffee. Would one really get better coffee because of the shape of the filters? Why Filter Cone Coffee is good? Filter cone coffee as the name implies comes from coffee that is brewed using cone filter and one of the best that is in the market is Melitta Ready Set Joe. While brew rite filters are white in color, they are not bleached, they are white because of a process that involves the use of oxygen and the reason for their popularity. The problem with large filters can actually be solved very easily, the problem actually lies with us! Why do you want to buy a larger size filter for your coffee maker? kenwood filter coffee maker might not be the most sophisticated coffee brewer around, but that does not negate the fact that it is a good coffee machine that does good coffee. IF YOU CARE unbleached coffee filters are product that while serving your coffee needs, helps you do your part in conserving our nature resources. It helps you do your part for our environment. While reviewing the delonghi DC51TTW, it has many functions and features but the one element that allows it make better coffee is its 4 cup coffee filters. This Krups 4 Cup Coffee Maker Gives 10 Cups of Coffee! Most folks would call Krups 867-42 II Cafe Bistro as a krups 4 cup coffee maker, but the fact is, this brewer does 10 cups of coffee, so why it is even called that in the first place? This 24 Cup Coffee Maker by Total Chef is Cool!